Trains to Frankfurt leave from St Pancras station in the centre of London. Security and passport checks are carried out before boarding, so arrive at the station at least 30 minutes before departure. You’ll travel to Brussels with Eurostar, where you’ll change onto a Deutsche Bahn train for the remainder of your journey to Frankfurt, all on the one ticket. Seats are roomy and comfortable with fold-down tables and there are luggage racks. Most trains have sockets at every seat and wi-fi connectivity is also available on some trains. On Eurostar it is free, on Deutsche Bahn you may have to pay in Second class. You’ll find a bar buffet on board for drinks and snacks and toilets at the end of every carriage. 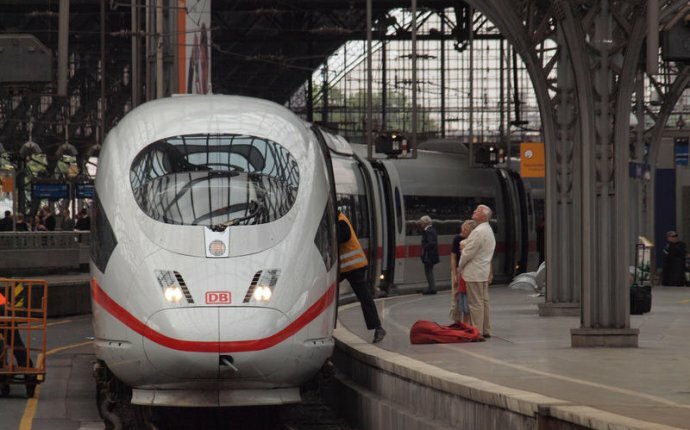 You’ll travel to Frankfurt on an Any German Station ticket, which covers your Eurostar journey to Brussels, plus the Deutsche Bahn train to Frankfurt. When you get to Brussels-Midi/Zuid, head downstairs and check the departure boards for the next train to Frankfurt.